'Do nothing to mar its grandeur for the ages have been at work upon it and man cannot improve it. Keep it for your children, your children's children, and all who come after you ...' Theodore Roosevelt. All the visitors to the Grand Canyon will realize the truth behind these words. The Grand Canyon is a wonderful gift from Mother Nature to the inhabitants of this planet and its beauty speaks volumes about it. Stand in front of it and you are sure to be awestruck by display of its splendor and enormity. Allow your soul to lick its wounds caused by the maddening schedule by taking a tour of the Grand Canyon. Check out the Grand Canyon skywalk and the various accommodation options. By air, land or river, the Grand Canyon is a place that can lend tired eyes a spectacular feast - one that will leave a lasting impression in your mind's eye. To capture a bird's view of the place, you can book yourself in a helicopter tour or fixed wing aircraft tour. Nearly all the tours begin from the Grand Canyon airport situated in the village of Tusayan directly outside the park boundary on the South Rim or from Las Vegas, Nevada. Statistics speak of more than half a million visitors enjoying the Grand Canyon air tours and helicopter tours. The prices are fixed according to the distance covered. Walking is best way to tour the Grand Canyon area. 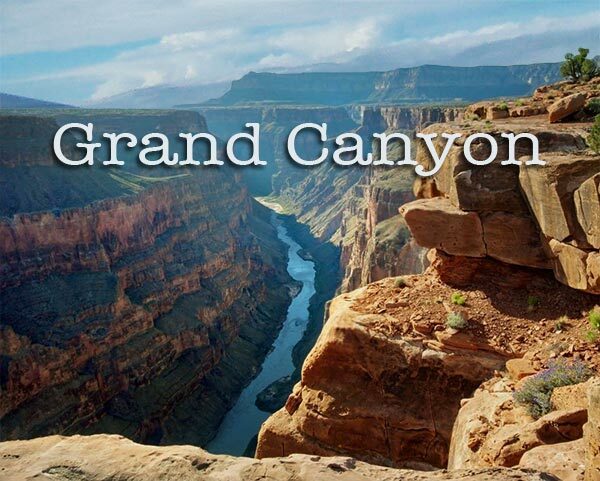 Car/van/bus rides of the Grand Canyon can be done individually or organized through a tour operator. There is always the option of hopping on to a mule and exploring the expanse, or hiking during the day or with a backpack for travelers in the night. Mule rides, night backpacks and hiking in the Grand Canyon require advance reservations. The Grand Canyon can also be covered on the Grand Canyon Railways. Drifting on the waters on a raft is another novel way to explore the Grand Canyon and is often described as a lifetime experience by all the travelers. There are as many as sixteen licensed raft operators to serve the travelers. Number of trips for every rafting company is limited keeping in mind conservation of the existing delicate ecology alongside the river basin. Dories, kayaks, oar powered inflatable rafts and lumbering motor rigs are the popular options to explore this expanse of the Colorado River. Trips last from one day to two weeks depending on the traveler's choice and are priced accordingly. Declared as the seventeenth national park in the United Sates during the year 1919, the Grand Canyon national park covers 1,218,375 acres of land. The park stretches from Lee's ferry on the Utah/Arizona border to the Grand Wash Basin located in northwestern Arizona; the park includes the Kaibab forest land and the North Rim. About five million visitors throng the Park every year of which fewer than 10% visit the North Rim. The Park houses a large diversity of animals and plants and is home to many endangered species too. Entrance fees for the Park is $20 per private vehicle and $10 per pedestrian or cyclist/motorcycle rider. The fees for commercial tour passengers vary, fees includes both north and south rim and admission is for seven days, fees once paid is non-refundable, leashed pets are allowed in the park. There are several outdoor displays that give a guideline on what to do while at the park, the park has a number of restrooms, pay phones, book stores and shuttle bus stops. Lodging options in the Grand Canyon are as many as the Grand Canyon itself. You can either choose to stay either inside the Grand Canyon Park or outside the park within a close proximity of the Park. There are wonderful accommodations at Williams, Flagstaff, and Sedona, you can choose from first class accommodation, luxury hotels, resort style accommodations, rustic cabin/cottage, bed and breakfast accommodations, or even a budget friendly family hotel. The restaurants at Grand Canyon offer some of the best cuisine that satisfy different taste buds. Steaks, sea food, south western cuisine, Asian cuisine, beer and burgers, family restaurants or fast food, there is no dearth of choice at the Grand Canyon. It is advisable to make your reservations in advance when you are traveling to the Grand Canyon. North Rim is over 8000 feet/2438 m above sea level. Summer is cooler when compared to the South Rim and thunderstorms occur during July, August and September. Heavy snowfall occurs during winters and the roads leading to North Rim are closed from November/December through May. Fall/Spring has uncertain weather conditions. May and October experience snowstorms at times and are usually the driest months. From mid October, the park has no supply of gas, food and only portable toilets will be available. If you have plans of staying inside the park in the North Rim, you have to make a reservation in advance, as there is only a single lodging, the Grand Canyon lodging inside the park. The price is $87 to $112 per night for two people. Outside the park, lodging facilities are available in the Kaibab lodge located 18miles to the north and in the Jacob lake inn located 45miles to the north of the park. You are sure to have your hands full while on a vacation at the Grand Canyon. With so many things to do, it is advisable you plan your Grand Canyon vacation so as to do justice..
You can explore the Grand Canyon by air, by helicopter or plane. You can fly over the Grand Canyon, Monument valley, Navajo tribal lands and Lake Powell. Rafting and float trips on the Colorado River is always tempting. Mule rides at Grand Canyon is a must do activity, without a mule ride your vacation will be no fun at all. It is so popular that you have to make your bookings at least eight months in advance. Places like the Antelope Canyon can be best enjoyed on a jeep tour. Hiking and trails is a great activity in the Grand Canyon, there are a few places in the Grand Canyon where camping is also permitted. Mather point, Yavapai and Bright Angel lodge are popular areas in the South Rim of the Grand Canyon to stop for a wonderful view. The Grand Canyon has a rich history behind it; it speaks in volumes about the early Spanish visitors, to the Western settlers. Take out some time to enjoy this wonderful place with a guide tour. Don't miss out on the Grand Canyon railways; it promises to be an experience of a lifetime. The scenario from Flagstaff downward all the way through the heart of Oak Creek Canyon to Sedona, Arizona is spectacular red rock country. Williams and Arizona situated outside the park are also wonderful places to visit. The Grand Canyon skywalk, which is a glass bridge construction, is suspended 4,000feet above the Colorado River right on the edge of the Grand Canyon. The construction of the skywalk began in March in 2004 and is expected to be open for public in the fourth quarter of 2006. This skywalk was mainly constructed keeping in mind the protection of the Hualapai Nation along with its heritage that is deeply engraved in the walls of the Grand Canyon. Tourists will be allowed a leisurely walk on an 80-yard semicircular platform sticking outside the Canyon rim. The Plexiglas will present an extravagant view of the Grand Canyon right below the visitor's feet. A fee of $25 per head will be collected from the tourist. Additional features of the skywalk are an underground canyon cellar for dining; a trolley designed to offer a ride for the guest and a rooftop dining facility as well. Rafting in the Grand Canyon is a wonderful experience, a stretch of 280miles from Lees Ferry to Lake Mead. Commercial companies offer rafting trips on the white water for short as well as long periods, short periods will mean anything between 3-4 days and long period rafting can be for weeks together. Majority of the rapids are situated in the Upper Grand Canyon and there are as many as 150 rapids. Tourists prefer the Upper Grand Canyon for its depth and for the few exit points it offers not to mention the picturesque beauty it has to offer. Rafting begins from Lees Ferry and exit points are available at Whitmore Wash and Phantom Ranch, people exiting in the former point can be picked by helicopters and people who wish to go on a hike trail can choose to exit at the latter. People who like to go on long trips need to go rafting from the Upper Grand Canyon to the Lower Grand Canyon that ends at Lake Mead. Rafting in the Grand Canyon is a fantastic experience while you get lost in the beauty of the natural scenario engulfing you. There are waterfalls, side creeks, grottos and exiting rapids at both the places. It is recommended that any tourist wanting to go rafting take an experienced guide along as the water conditions are best known to them. Almost every visitor to the Grand Canyon would want to take up a hiking trip therefore it is advised that you make your booking for permits well in advance. The Park issues around 13,000 permits per year and bear in mind that this hiking experience is totally different from other experiences you have had. The climate is desert type at the hiking trails and majority of the park space is not accessible as they are cliffs and only desert plants and animals can survive there. Phantom Ranch will be the point where hikers will cross the Colorado River. Hikers covering rim to rim have to manage the elevation difference that they will face. There are experienced hiking guides who can help you and if you do not get permit for night hiking then you can always choose to hike during the day and this experience will be a far safer one. South Rim: March is cold and there might be snowfall until early May, June is hot and dry. July and August are wet and accompanied by heavy thunderstorms. Fall has very erratic weather schedules, snowfall begins from November. North Rim: Mid-October to mid-May is closed for vehicular traffic due to heavy snowfall. The elevation of North rim is more when compared to South rim, snowfall may go over 100 inches. Summer in the North rim is usually clear and cool and July and August may face occasional thunderstorms. Inner Canyon: Temperatures here match desert temperatures and it is hottest between the months of May and September. Rain fall is mainly during July and August.